When a neutrino strikes an argon atom inside the 760-ton ICARUS detector, the interaction creates other particles, which in turn release electrons from the argon atoms. The chain reaction results in a streak of released electrons in the giant vat of liquid argon. Like the crest of a wave heading toward the shore, this streak of electrons drifts toward charged wires that line the inside of the ICARUS detector. The wires generate an electric field that fills inside of the detector, drawing electrons toward themselves along the ‘grain’ of the electric field. Once the electrons reach the wires, the wires transmit the signal to computers outside the detectors. Scientists read the data to get information about the neutrino that kicked everything off. 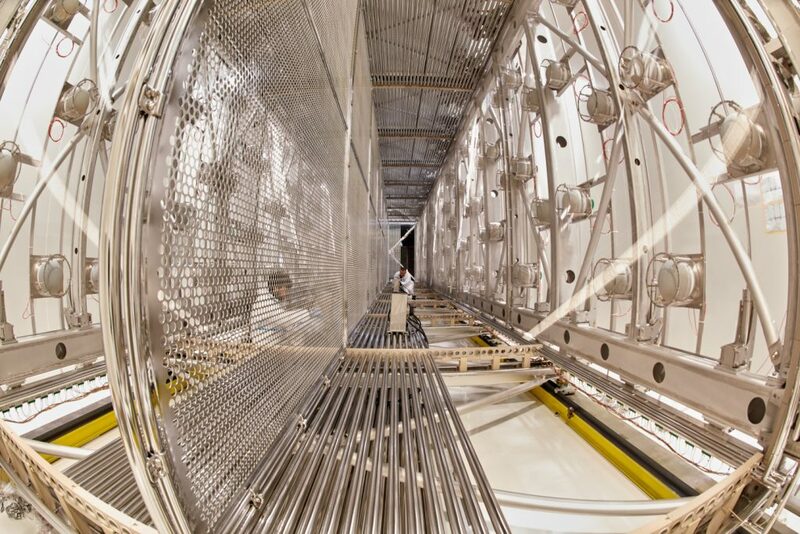 The ICARUS detector itself is composed by two semi-independent, symmetric modules filled with liquid argon, each approximately 3.6 meters high, 3.9 meters wide and 19.9 meters long. The charged particles passing inside the volume, where a uniform electric field is applied, produces ion-electron pairs. A fraction of them, depending on the field intensity and on the density of ion pairs, will not recombine and will immediately start to drift parallel to the field in opposite directions. Only the motion of the much faster electrons induces a current on a number of parallel wire planes located at the end of the sensitive volume. It must be an excellent insulator and available at an extremely high purity level, so that free electrons produced by ionization can drift in the liquid over long distances. It must have a high electron-ion pair yield with respect to the energy deposited in the liquid. It must be easily available in large quantities, which is the case for argon, a natural component of the Earth’s atmosphere (1 percent). One of the two new ICARUS cryostats during its assembly at CERN workshop. 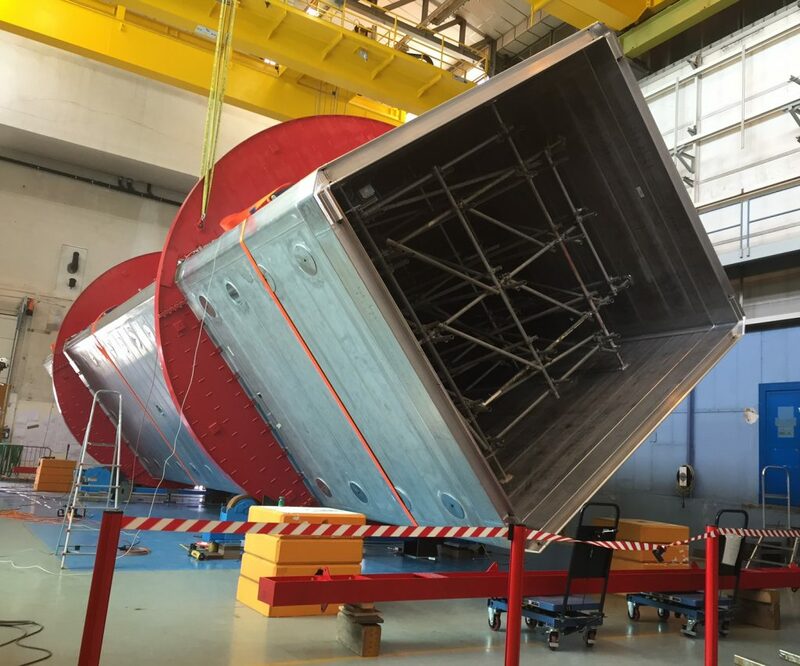 The read-out chambers (two TPCs for each half-vessel) are mounted on the internal walls with the cathode at the center, to maximize the liquid-argon-sensitive volume (corresponding to about 480 tons in mass). The read-out chamber scheme consists of three parallel planes of wires (horizontal, +60 and -60 degrees). Information is read both by electric charge induction on the first two readout planes encountered by drifting electrons and by electric charge collection on the last readout plane. The signals from the three wire planes, together with measurement of the drift time, provide a (redundant) full 3-D image reconstruction of the event. The main features of this type of chamber is that there is no charge amplification inside to allow the drifting electrons to induce signals on different wire planes. This requires a high quality electronics to maintain a good signal over noise ratio. The total number of electronic read-out channels is about 55,000.